Even if you are confident in your swimming skills, you still need a life jacket. No questions asked. A big concern people usually have when they come rafting with us is their safety. For good reason! When done unprofessionally, whitewater rafting can put you at serious risk for injury. Luckily, our trained staff at Southwest Raft & Jeep know exactly what to do so you’re in good hands throughout your entire trip. But there are still a few helpful ways to ensure that you’re keeping yourself safe. 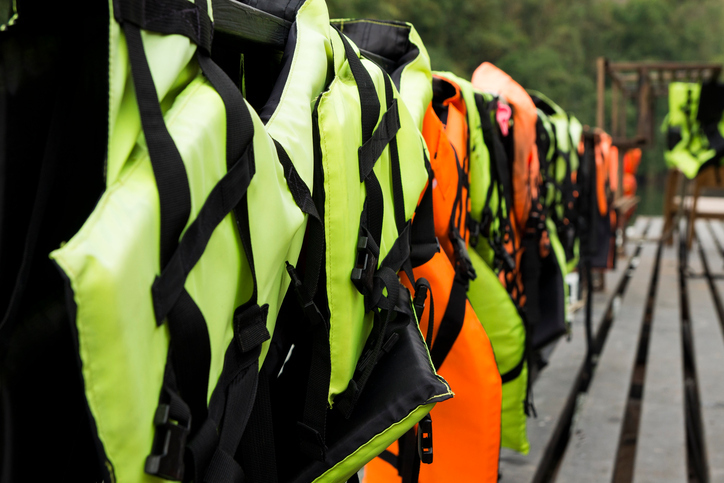 Read on to see some tips on how to stay safe during your whitewater rafting trip. If you’ve never been on a rapid before, there are specific ways to move your body when you capsize. It’s best to go into a rafting expedition assuming you will capsize, because knowing how to swim out of the situation is vital to your safety. The best way to stay safe when you’re knocked into flowing rapids is to point your toes downriver while bending your knees, and to float on your back. Your legs will absorb any contact with rocks, and you won’t have to worry about tumbling along in the swift current. Keep your lifejacket on at all times. We will provide you with a life jacket before your expedition, and it’s vital that you keep this on throughout the entire duration. Even if you are confident in your swimming skills, you still need a life jacket. No questions asked. Don’t unzip or unbuckle your life jacket just because you feel hot under the summer Colorado sun. Always double check that your buckles are done correctly, because it can mean the difference between staying afloat and having your jacket ripped off the second a swift current picks you up. The water of the Animas River can get seriously cold, even during the summer; the water comes from a higher elevation. Remember, you can see snow on the tops of mountains in the middle of July! This means you can get hypothermia if you’re underdressed. Ask us more about what you can wear to protect yourself, but generally, any local sports store will have what you need. Think quick-drying clothes, closed-toed shoes, and long sleeves. And apply sunscreen liberally! Sunburn can happen quickly at high elevations. Ready to book your trip? Call Southwest Raft & Jeep today!